As I was updating my list of books – a couple of new additions as I told you a while ago – I kept thinking of ways to make it more functional and interesting: therefore, I’ve changed it a bit. I hope you all like it. Preheat oven to 180°C/350°F. Butter two 22x12cm (9x5in) loaf pans*. In a large bowl, beat butter, dulce de leche, brown sugar, and granulated sugar with an electric mixer until smooth and creamy. Add vanilla and eggs, one at a time, beating well after each addition. Scrape the sides of the bowl occasionally. Add flour, baking powder, salt and cinnamon; beat again until combined. Transfer batter to prepared pans, smooth out the tops, and bake until loaves turn a deep golden brown and a toothpick inserted in the center comes out clean, 60 to 75 minutes. Set aside to cool in pans about 45 minutes; then carefully unmold onto rack. Dust with icing sugar to serve. So when cakes sank in the middle they needed more flour? This is a revelation to me...so many thanks!!! I always thought it was a problem in the cooking method... so a batter not properly cooked deflated once out of the oven. But I need to try hands on now! Hey Patricia! This cake is on my to-bake-list for sure ;-) Greetings from Switzerland! You just gave me a huge desire to go cookbook shopping! This pound cake looks wonderful! I can't let my husband see this. I made dulce de leche for him last month and since then he has been obsessed with all things dulce de leche. Last night he asked me to make some dulce de leche cheesecake bars this weekend. If he sees this, I BET he'll request it too. I am saving this recipe so I can make it for him soon. Probably Valentine's Day. He'll fall in love again for sure! My dad's been wanting a nice slice of pound cake (or was it sponge cake?). Either way, this looks yummy! I have been getting many signs that I should make some dulce de leche and this is a major one! Want some of that now!! Martina, a very hot oven may cause the cake to deflate, too - since I controlled the temperature all the time I believe that in this case it was the flour factor. Anilou, you can boil a can of sweetened condensed milk for 40 minutes in a pressure cooker (with lots of water) - the result is dulce de leche. But it's a dangerous procedure, be careful. The can has to be completely cool before you open it. Ccnballi, I did not add the additional flour to the recipe. It will depend on which pan you choose - for the loaf pan I would add 1/2 cup of flour and see what happens. This sounds fabulous and I've been on a Dulce de Leche kick lately! That is great news! I'm so glad you liked the cake, tks for letting me know! 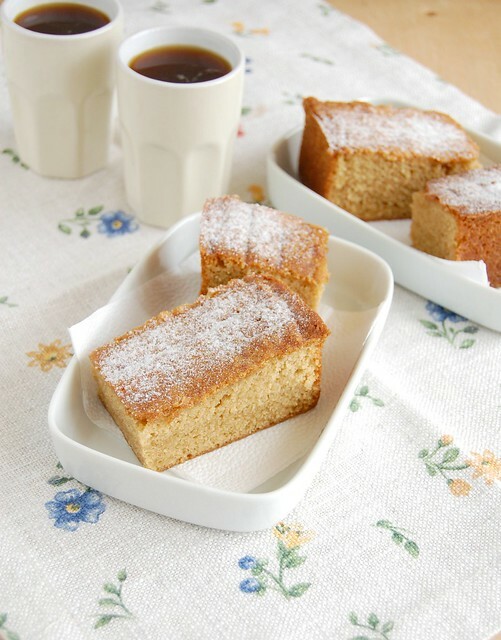 What a great pound cake, I´m dying to make it! And it has brown sugar which probably makes the flavor even better. A good way to avoid the sinking middle, besides adding more flour, is to make smaller cakes, like mini loaves.